Perfect for any couple who want to share the most memorable moments together. 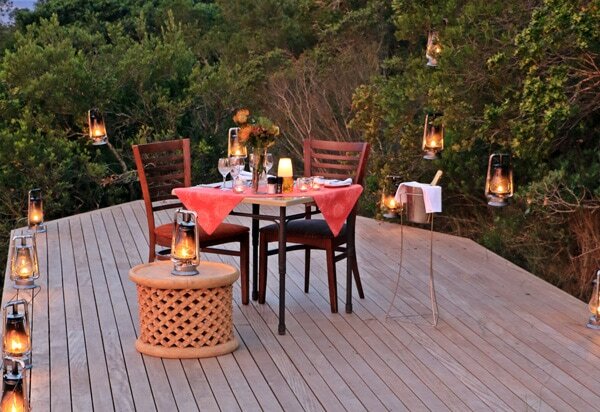 As one of our resident guests enjoy a private dinner full of candles under the South African night sky. The perfect menu prepared for you and your partner showcasing some of the Garden Routes most amazing produce and flavours made all the more amazing with your own private location. Please book 24 hours in advance. Full deposit required at time of booking. Refundable. Confirm on arrival by producing same credit card used to make booking. – 30% Cancellation fee on the total booking if cancelled 44 days to 30 days prior to arrival. – 50% Cancellation fee on the total booking if cancelled 30 days to 22 days prior to arrival.